Hurtgen was a cold, jungle hell -- a death factory. Blocking approaches to Cologne and the Ruhr, Hurtgen was a "must" objective. The terrain was difficult enough — steep hills, thick woods, numerous creeks, poor roads. Across the front stretched belts of mines and barbed wire rigged with booby traps. 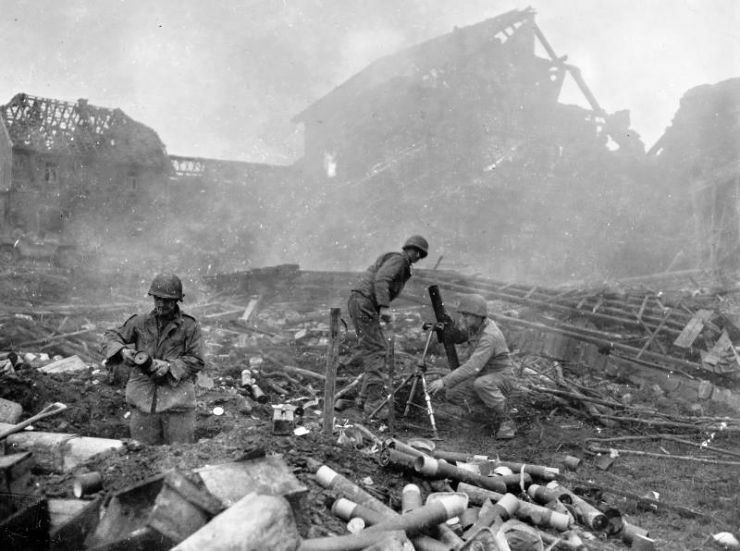 Dug-in machine guns were set up to spray the entire area with interlocking fire. Artillery, doubly dangerous in the woods because of tree bursts, was zeroed in on every conceivable objective. Weather was pure misery -- constant rain, snow, near freezing temperatures. Living for days in water-filled holes, usually without blankets, troops had no escape from cold and wet. Before the main offensive gut underway, the 12th rushed south to aid a division under heavy enemy pressure. The regiment fought bitterly for eight days, attacking and counter-attacking without flank support. Although it suffered heavy casualties, the 12th returned to join the division's assault Nov. 16. On the south flank of the offensive, the 4th attacked through the forest toward Düren. Again, its front was extended. To the left of the 12th, now commanded by Col. R.H. Chance, was the 22nd and the 8th, the latter now led by Col. R.G. McKee. For three days the regiment struggled to crack the first enemy lines. Every yard was difficult, dangerous. Firebreaks and clearings were mined. In the thick woods, German positions couldn't be detected more than five yards away. Yet, Nazi outposts could observe the 4th's approach. Every move brought instant artillery and mortar fire. The line of wire and mines seemed impossible to crack. Machine guns and artillery blunted every attack. Reaching a firebreak which crossed the front, the 70th Tank Bn. finally broke the wire, rolled beyond. Infantry followed in tracks made by tanks after armor had detonated anti-personnel mines. In pushing the front forward 1000 yards, the division suffered heavy casualties the first five days. The next enemy line was as tough as the first. The identical procedure had to be repeated. Another five days produced another destroyed line, another mile gained. Germans brought up fresh regiments, counter-attacking daily. Often, companies were caught before they had a chance to get set. It took another battle to throw back stubborn Germans. After every advance, men spent hours digging holes and cutting logs to cover them. Artillery often whined, burst in the trees before shelters could be finished. After a day and night of vicious fighting, the 22nd reached Großhau. 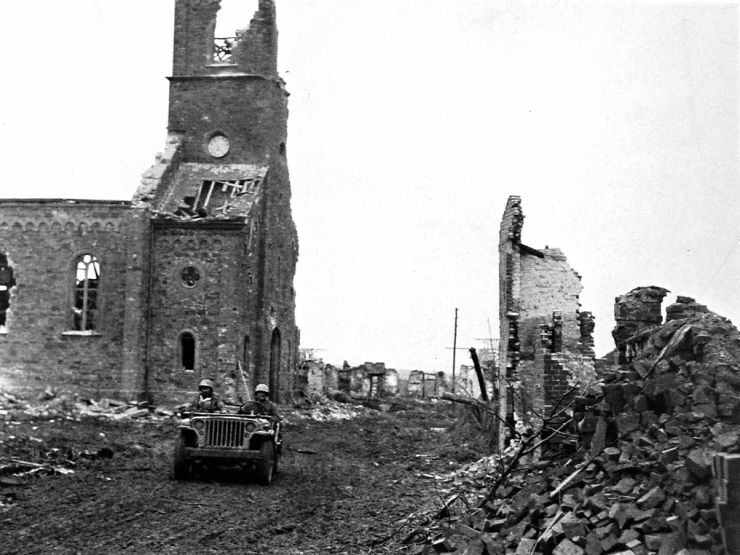 2nd Battalion 22nd Infantry jeep rolling through the remains of Grosshau, Germany on December 1, 1944. Nov. 27, wiping out German defenders before going on to the last strip of the forest beyond the town. Still in the woods, the 8th and 12th crashed the third MLR, which was as rough as the others. The Nazis had overlooked no bet. Every approach was covered with every device of defensive warfare. Neither skill nor genius could find an easy way. It took sheer guts to win. After three days, both regiments shattered the last line and broke through near the east edge of the forest. Then came welcome news. Relief! The 22nd moved to Luxembourg Dec. 3, followed by the 12th four days later and the 8th on Dec. 13. The drive required a continuous display of top-notch leadership and the highest order of individual courage under the most adverse conditions. The fact that the 4th Division overcame these many difficulties and drove the enemy from the dominating hills overlooking the Roer River is a tribute to the skill, determination and aggressiveness of all ranks. After Hurtgen, Luxembourg was heaven. Dry, warm houses were a welcome change from holes full of icy water, from incessant shellings. Since the division's sector extended 35 miles, each platoon covered about a mile. Although there was snow, rain and cold for men on post, it was a comparative rest.